A truck driving school is about more than just classrooms and trucks, it's about people. 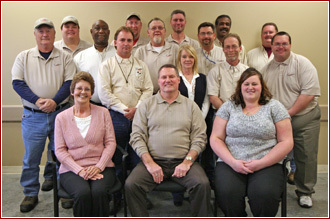 And at C1 Truck Driver Training-Indianapolis, we have assembled a dedicated team of trucking professionals. C1 employs over 15 full-time driving instructors and each of our instructors is a veteran professional trucker with at least 2 years of driving experience. Each one of the driving instructors has completed C1's own extensive instructional program on effective CDL training techniques. This program ensures each member of the C1 training team is training students in a consistent manner that meets our high standards. Successful truck driving training starts with right teaching. Years of providing top notch CDL instruction means we have the people with the right skills and attitude. C1's dedicated and compassionate staff ensures every training experience is a positive one. C1 Truck Driver Training in Indianapolis has a special club called the "CDL Ace Club." Our entire staff takes great pride in training each student, so we offer the CDL Ace Club to recognize the best of the best. We put a lot of hard work into preparing every driver to pass the state CDL skills test and feel those who "Ace" this challenging test on the first try deserve something extra special. All members of the CDL Ace Club will receive the prestigious Red C1 Graduation Hat (all other hats are black) with the words "CDL Ace" stitched in gold on the side. "Acing" the CDL skills test on the first try isn't any easy task, so if you see someone wearing the Red C1 Grad Hat with "CDL Ace" on the side, be sure to tell him or her "great job!" * Pictured above is the C1 Indianapolis Staff with inaugural CDL Ace Club member, Steven Dolan.